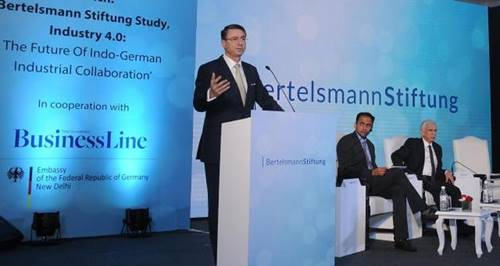 Creation of industry awareness, establishing a skill-building expert group and an Indo-German industry ecosystem will help boost business and trade ties between India and Germany, according to a study, Industry 4.0: The Future of Indo-German Industrial Collaboration, by Bertelsmann Stiftung, in cooperation with BusinessLine. “Germany has put digitisation on its agenda for inclusive global growth. Education is essential for skills. Regional Centres of Excellence for digitalisation of skills have helped German SMEs. Digital economy does not stop at national borders. Industrial performance from Germany and software development from India complement each other to develop Industry 4.0,” Martin Ney, German Envoy to India, said here on Wednesday while launching the study. According to the study, accelerated digitisation would create 240,000 new jobs. It also stated that a large share of employment in Asia is susceptible to automation. “We are in the final leg of drafting the industrial policy. We are specially focussing on India becoming a part of the global value chain. We will take forward manufacturing to a different level, but also focus on promoting leadership,” said Atul Chaturvedi, Additional Secretary at the Department of Industrial Policy and Promotion, under the Ministry of Commerce and Industry. Chaturvedi said the government is now doing faster trademark and patent registrations and is also focussing on manufacturing competitiveness. He added that the government has taken several initiatives in improving the business environment of the country by undertaking certain structural reforms. R Chandrashekhar, President, NASSCOM, said the emphasis of the industry has shifted to a skilled workforce with IT playing a significant role. He also said that limitation of SMEs in investing can be enabled by IT platforms. Since SMEs lack resources most of the time, the study will help identify the right IT platform and toadopt the right technology to take their businesses to the next level, according to Bernhard Holtkamp, Senior Scientist, Fraunhofer ISST. The study also focussed on how both countries should strengthen their efforts to create awareness for Industry 4.0, especially among SMEs. Germany should put more emphasis on making their Industry 4.0 technology known to the Indian market. India’s IT giants, on the other side, should make their Industry 4.0 offers more visible to the German market.